it looks like everything should work.. but time will tell. of course, I have no power to the box yet.. we need to dig a trench and run wires 120 feet. I am going to need some heavy duty wires for that run! I also took time to make sure that I have nailing surfaces for all of the interior wood paneling.. added some extra depth to the rafters so that they will take the full 7 inches of insulation that I plan on putting in the roof. installed the pro vent panels for venting purposes.. I went to Lowes to see if they had the old time metal sofit vents.. and they did not.. i guess it is a specialty order thing these days.. at least in our area where everyone uses vinyl. a couple of loose ends to manage and then it is time for insulation.. and then I can begin installing the interior paneling. At that point, things will really start to get exciting! I hope that everyone is enjoying a meaningful Memorial Day Weekend! 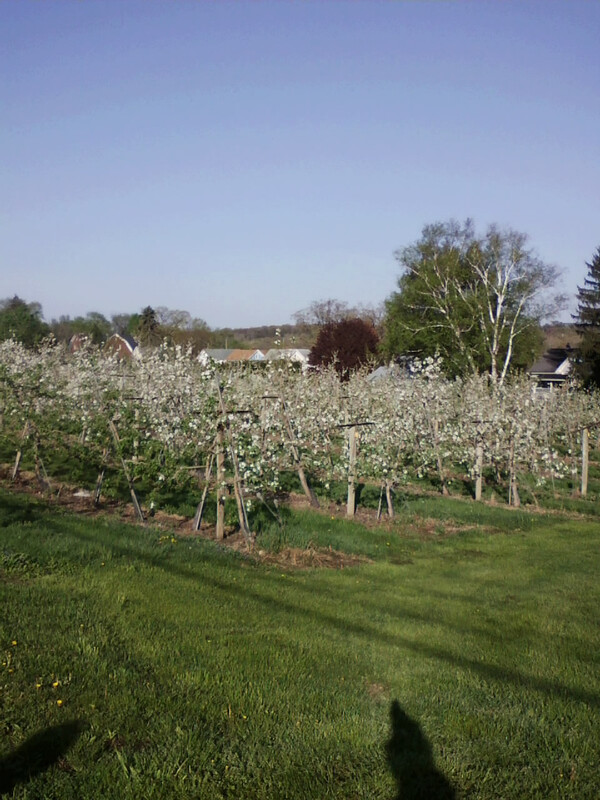 I had the opportunity to spend Friday – Sunday at the orchard. 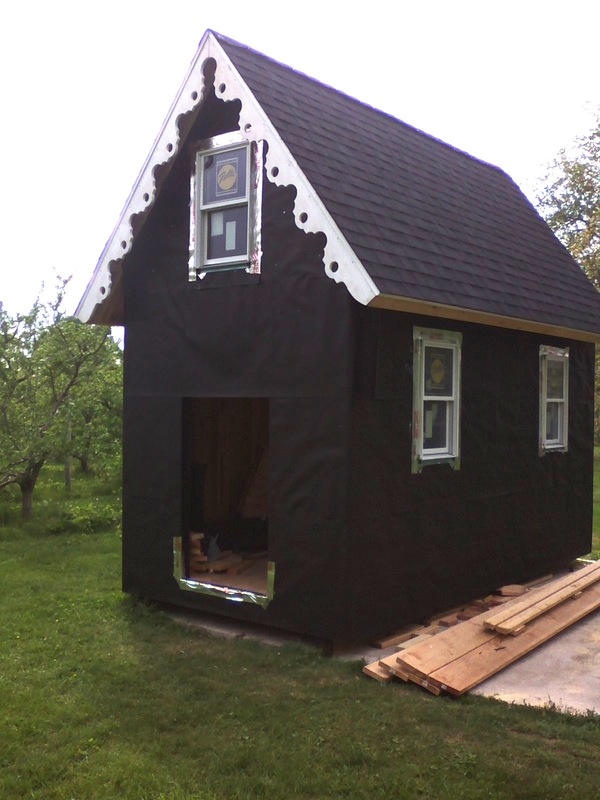 Friday evening I finished the second gable end – tar paper and two windows… After a short bike ride and eggs for breakfast at my mother-in-law’s on Saturday, I tackled the last side of the house.. tar paper and one window.. and then got the door in and the little portico hung.. not sure about the final placement – it is a bit high right now with the thought that we will fit an exterior light beneath it which needs to clear the screen door. The second option is to place the light to one side or the other and lower the portico.. that will be my wife’s decision – but feel free to chime in ! So, I am planning the electrical layout.. getting ready to pick up the insulation.. and really getting excited to finish off the inside.. I told my wife to wait till I got things cleaned up before coming out to check the recent progress.. she was thrilled.. when she saw the loft, she suggested that we make a spot for the porti potti up there.. the loft is 9 feet long.. and there should be plenty of space , so that is a great idea.. no negotiating a ladder in the middle of the night She is 5′ 2″ , and she is thrilled that she has standing headroom in the loft.. the benefits of being short! We did finalize some planning for the house.. we will run a sub panel from my brother in law’s house.. maybe 30 or 50 amp. depends on how expensive the wire will be for a run of about 120 feet. And we will install a vented gas heater along with a small ( 20 inch) gas stove .. time to order those and to run the gas pipes.. Looking forward to lots of time to work this coming week.. final exams tomorrow ( yes, on the holiday ) but then free most of the rest of the week!! Another weekend and lots.. well, some progress.. never as much as I anticipate! We have one more week of school, followed by final exams, and after that, I will have significantly more time to devote to working on the house. I sure am looking forward to having a chunk of time to spend on the project. Yesterday a couple was driving by in a pickup, and they slowed down and rolled down the window and shouted ” nice job” That is life in a small town at its best! 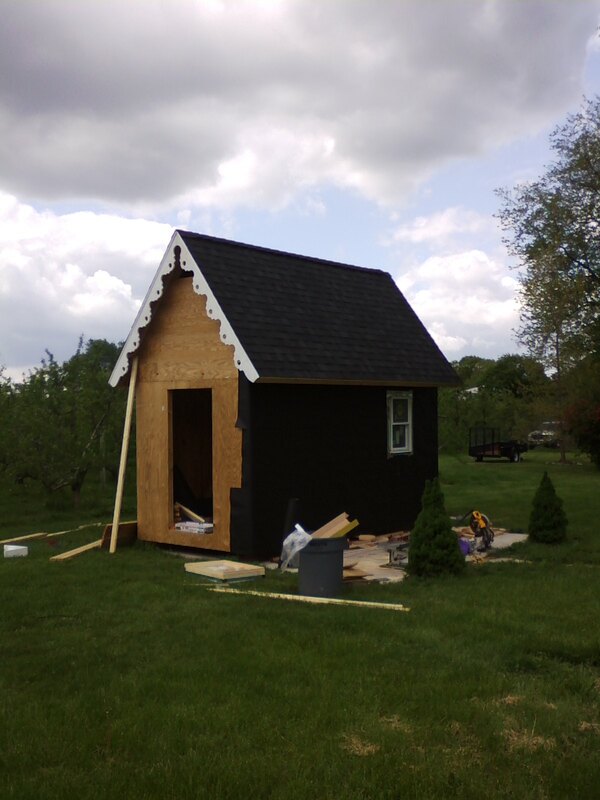 Pretty soon, we are going to have to make a final decision on the exterior siding … it won’t be too long till we need it! I am feeling wonderfully exhausted! Well, it has been quite a weekend.. I thought that I was going to work on the house both days, but then it dawned on me that I had a tech rehearsal on Saturday for our upcoming dance production. Bummer!! 6 hours sitting in the booth – wishing instead to be on the roof! Yes, that sounds pretty good, doesn’t it? 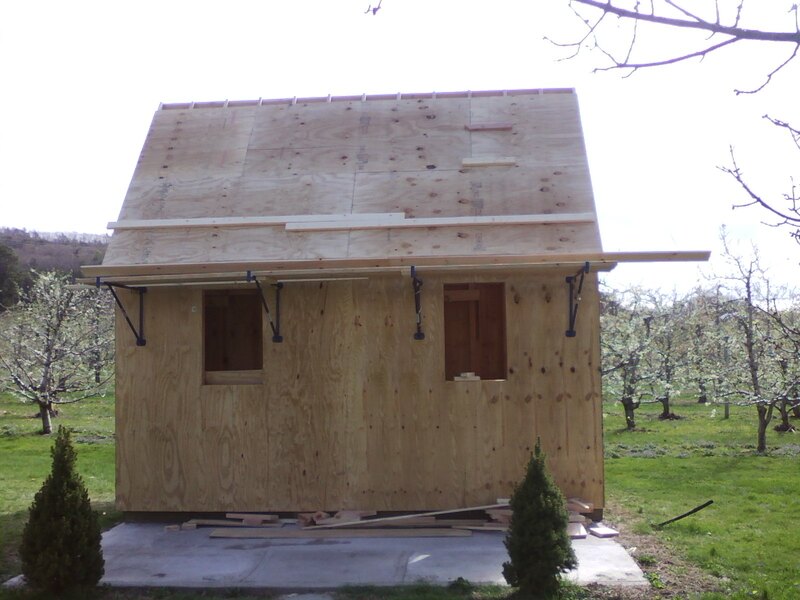 It was nearing 5 pm when I got to the orchard yesterday, but that meant that there was still about 3 hours of light.. so I tackled some of the preliminary work – closing in the other gable end, putting the overhang on the back side of the house – little things that would put me in good shape for today.. It rained a bit last night and things were still wet this morning, so we started the day off with a walk. 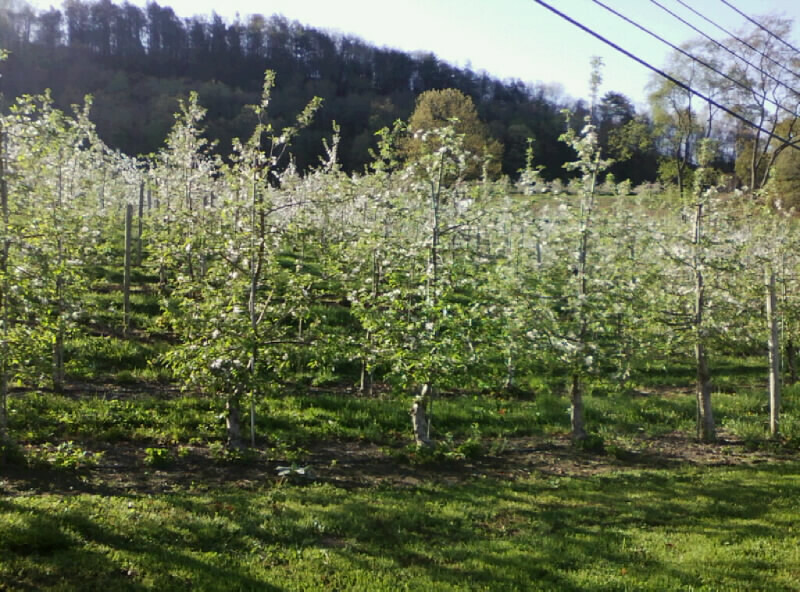 The orchard is in the middle of the bloom.. very pretty. It is kind of funny how we have already forgotten what a trying winter we had! Around 9 am the work began. 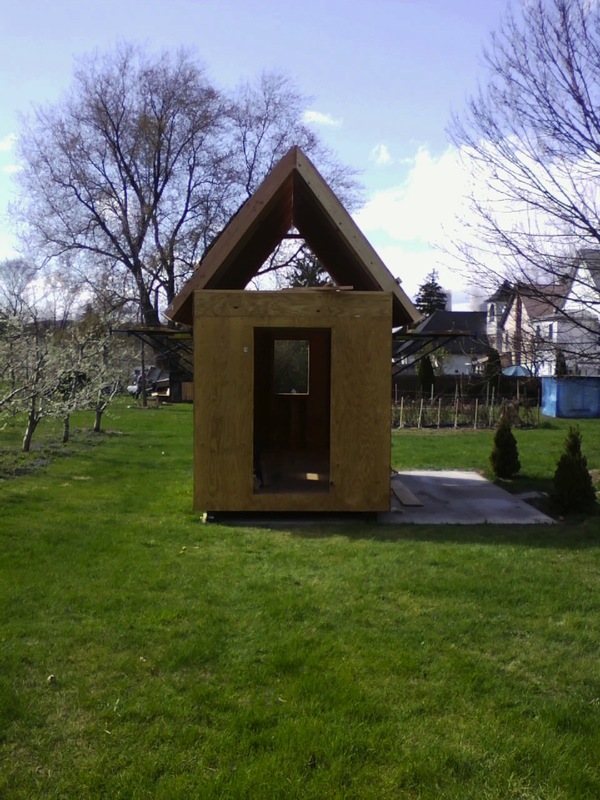 There was still prep work to be done before I could break open the shingles. 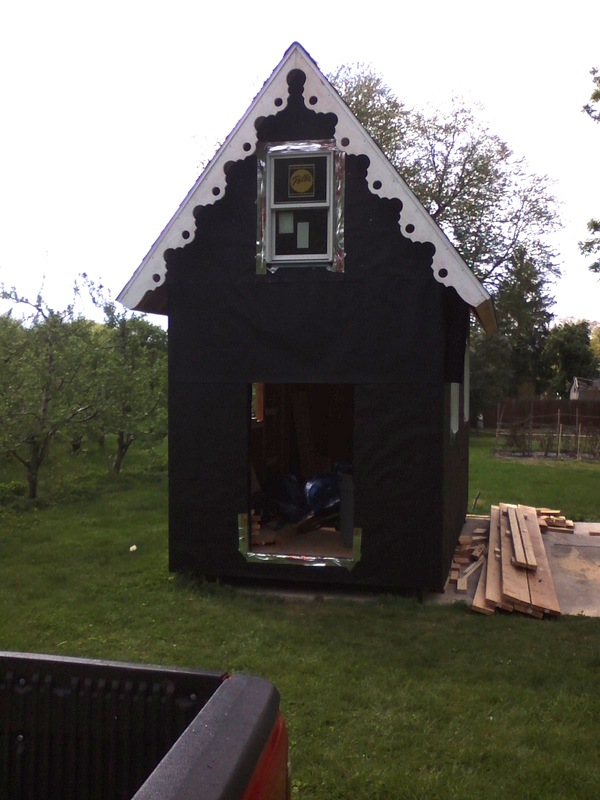 Some of the trim needed to be put in place … next came the drip edge and then the ice and water shield and the tar paper higher up on the roof. and then more drip edge.. and finally, it was time to shingle. 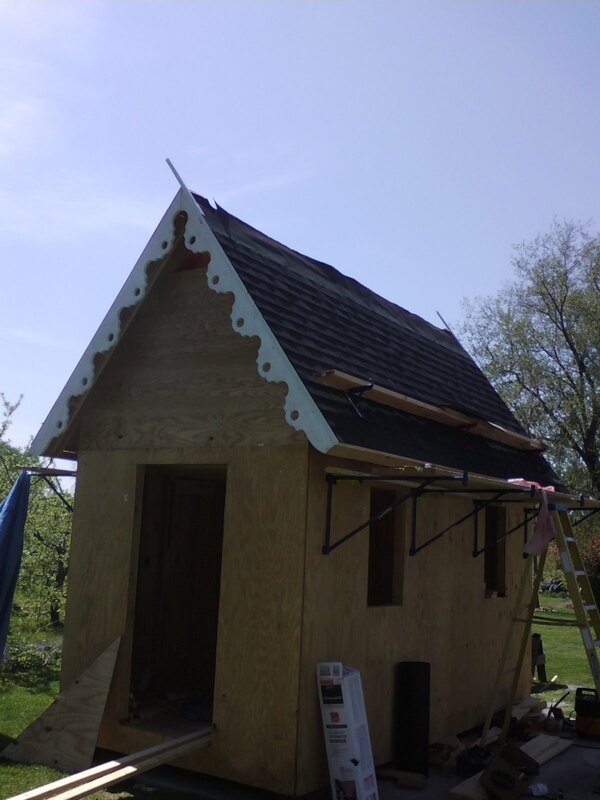 I was still thinking that I just might finish the roof by evening, but already, the up and down and climbing around had begun to take a toll on my less than in shape body! 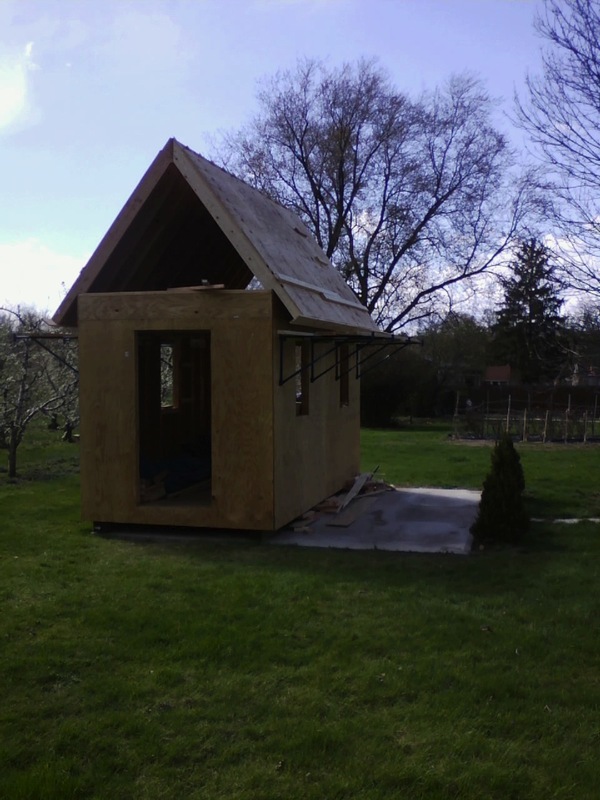 The shingles went rather well.. just a few adjustments along the way, and things fell very nicely. The roof jacks were an absolute necessity.. In some way the steepness of a 12 over 9 pitch is somewhat challenging, but, on the other hand, you don’t have to bend over quite as much! 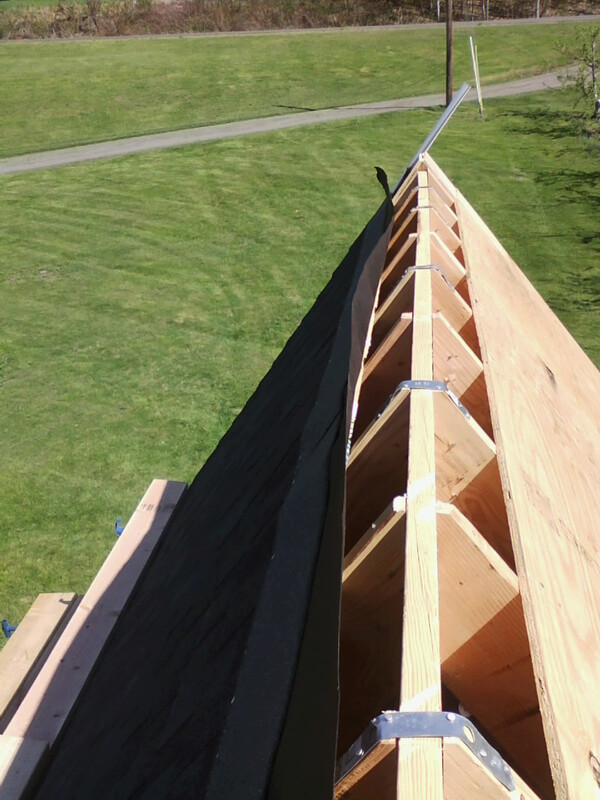 I need to fill in some of this space yet, but first I needed to install the strapping that you see here.. next trip I will make the gap appropriately sized for a ridge vent.. So it was not particularly comfortable sitting on that ridge, but the view was worth it! So, I could not help but think about the song ” Up on the roof” when I was sitting up there.. also thought about the scene in Anne of Green Gables when Anne decides to walk the ridge of the house and falls and twists her ankle.. avoided that ! 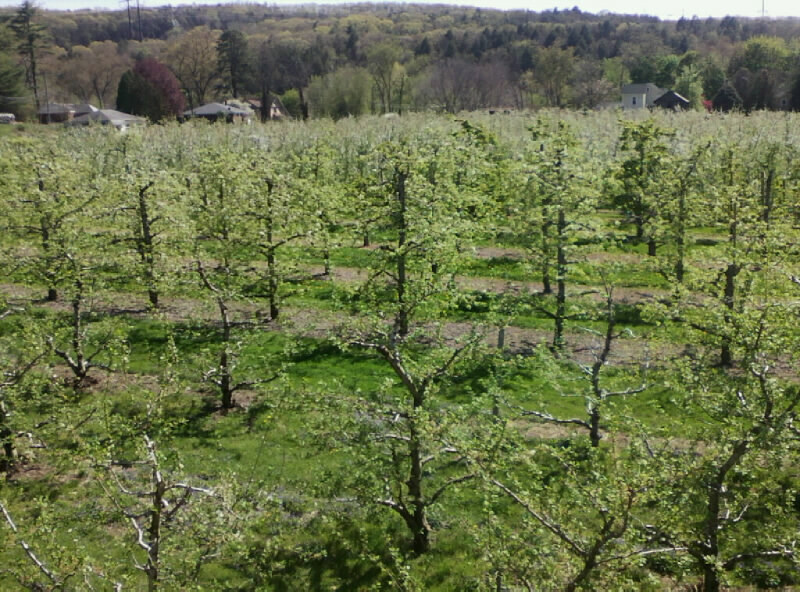 I also thought about how I used to climb trees all afternoon when I was a kid.. I sure don’t remember ever feeling this sore and exhausted then 🙂 But, there is nothing more satisfying then looking over what you accomplished at the end of the day.. even when it hurts to put all of your tools away! I guess you can expect this sort of thing when you live in Bear Creek! we were having a quiet morning, enjoying our oatmeal, when all of a sudden my wife put her bowl on the floor and jumped up.. this fella was out by our car and headed our way. She got a little excited ( thus the blurry picture) as he got closer to the house.. It dawned on me that I should take down the suet feeders that I just filled last night.. but they were already gone! He must have been around for a while.. We watched as he walked into the woods and retrieved the second of the two feeders. He probably ripped the first on apart in no time. 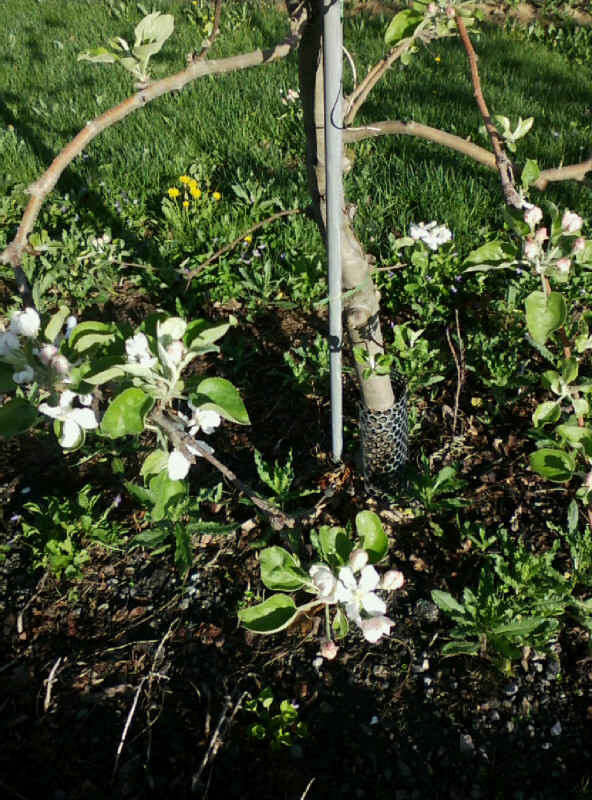 The second one was a sturdier version ( and more expensive) designed to keep out the squirrels. But it was no match for his strength. Soon he was munching on a snack of suet. 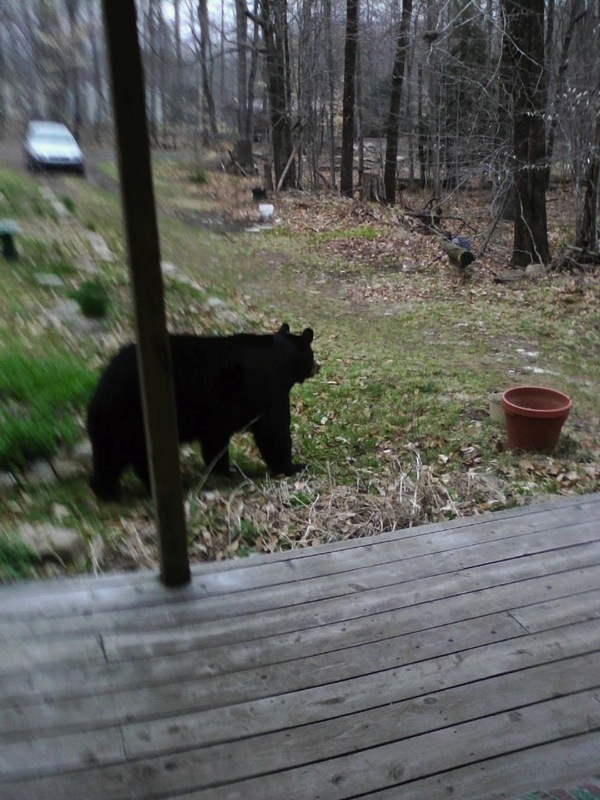 He walked around the house and eyed the feeder that is on the back deck.. I guess that it is good that I don’t have steps built yet – or that would have been gone too! 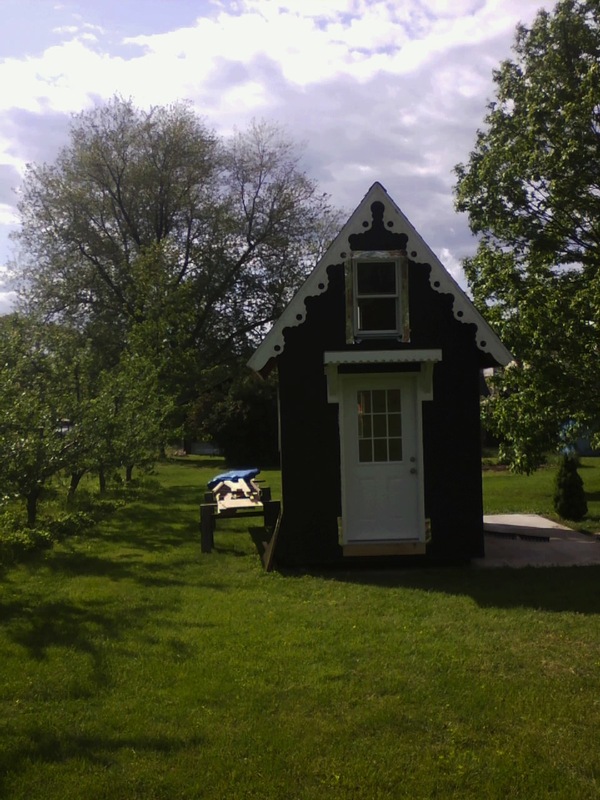 More work on the tiny house.